The 2002 Vega Sicilia Valbuena 5º Año is a red wine made by Vega Sicilia from Ribera del Duero that is based on the best of tinto fino, tempranillo, merlot and cabernet sauvignon of 2002 and shows an alcoholic strength of 14%. 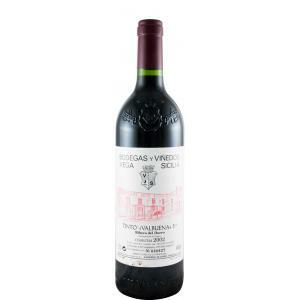 The 2002 Vega Sicilia Valbuena 5º Año is the ideal red to combine with hard cheese and foie. Uvinum users reviewed this red wine with 4 of 5 points and obtained the following scores: robert parker: 92 and wine spectator: 88. - Nose: nose wild rosemary. - Mouth: fresh, acid and high attack. If you want to buy 2002 Vega Sicilia Valbuena 5º Año, at Uvinum you will find the best prices for Ribera del Duero red wine. Get it at the best price at Uvinum, wherever you are via all your devices. We offer a large catalog of wine, beer and spirits and we are the leaders in sales of wine, beer, and spirits in Europe with more than 38.000 clients who trust us.